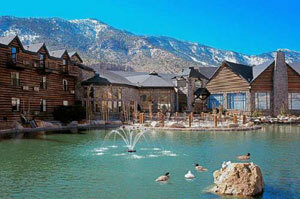 Do you need high speed internet for a convention or other temporary event in Mount Charleston? LV.Net has been providing the best in internet service for over 16 years. Our high speed wireless microwave network is top tier and is available in Mount Charleston. LV.Net’s high speed wireless microwave network operates through a series of radio relays. Relays are located all through Nevada and in some parts of surrounding states. Microwave broadcast travels at close to the speed of light. Our microwave network provides internet speeds of up to 1 Gbps without difficulty. Distances between relays stretch for miles. Over distances that signals traverse by wireless microwave transmission, there is no issue regarding maintenance of a fiber cable, or concern about the environment affecting a cable’s performance or reliability. Wireless microwave internet can be installed in one day in some cases, and can serve areas that are difficult to reach with fiber cable. LV.Net can install microwave internet in almost any place or type of building, such as hotel & motel facilities, business complexes, residences, warehouses, parking lots, campgrounds, remote parts of the desert, and vacant plots of land. Microwave internet service can cover any location regardless of climate, conditions, or altitude. LV.Net has the tools and resources necessary to fulfill any and all high speed internet needs. LV.Net’s technical support team is well trained and experienced. They are available 24 hours a day, every day of the year, and make sure that your wireless internet connection stays up and running regardless of the circumstances. LV.Net’s microwave network is designed for 99.999% uptime. It has a redundant power design. Towers with multiple transit links utilize OSPF protocol and mesh topology for fail over. Equipment that permits pro-active management and maintenance reports and alerts of usage or port errors. LV.Net uses licensed carrier grade radios on major backbone points. Equipment is standardized and kept in a spare state in the event that technical staff decide to use duplicate equipment. LV.Net can install fully secure private business networks. We also offer colocation hosting and cloud computing solutions. LV.Net can install point to point networks that connect two computers or networks that are fully secure. Advantages to using a point to point business network include improved security of communications between a company’s multiple locations. Improved data transmission capability, cost effectiveness, and versatility can also be additional benefits. Colocation services from LV.Net provide enterprise class amenities. Our facilities have convenient hours for accessing equipment, flexible bandwidth & space options, in addition to 24/7/365 technical support and monitoring capabilities. Our facility in Las Vegas (Network Operations Center) is designed for hosting your equipment in a secure and stable environment. It provides a reliable area to store and manage your important data. Cloud computing allows users to locate equipment on LV.Net premises and access it using the internet from a remote location. “Front end” equipment that is located offsite can potentially be minimized, and “back end” equipment that is located on LV.Net facilities can be used to a greater potential. It can be easier to maintain and service back end equipment when it is located on LV.Net facilities. This can produce economies of scale that benefit the user. If you are considering high speed internet for a convention or other temporary event in Mount Charleston, please contact LV.Net today at 702.900.0000 to discuss your requirements. LV.Net will be in Mount Charleston to deliver top tier high speed wireless microwave internet, and we look forward to speaking with you. Have a convention or in need of temporary High Speed Internet 1Mbps to 1000Mbps in Mount Charleston call us now 702.900.0000 for a quote or email us.